My sister-in-law, Isela, makes THE BEST salsa and showed me how-to when she was up for a visit from Arizona...before they moved to the Netherlands. Yes, I am jealous that they live in Europe and I don't. (Her ceviche is incredible too. I'll have to eventually post that recipe as well.) 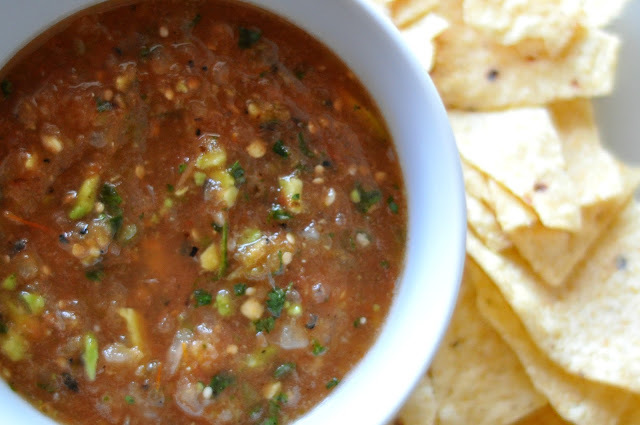 A salsa recipe this good needs to be shared! I probably don't make it the exact same way she does, but the flavor is the same so that's what matters. Of course, if you like it melt-your-face-off-hot, add more peppers. If you like it mild, only put in one or two. It's completely up to you. Hope you enjoy! (Total price for my ingredients was $5.74 and it made 8-ish cups.) I keep saying that I'm going to try freezing the leftovers to see if it will freeze well, but don'tcha know, we never have any. 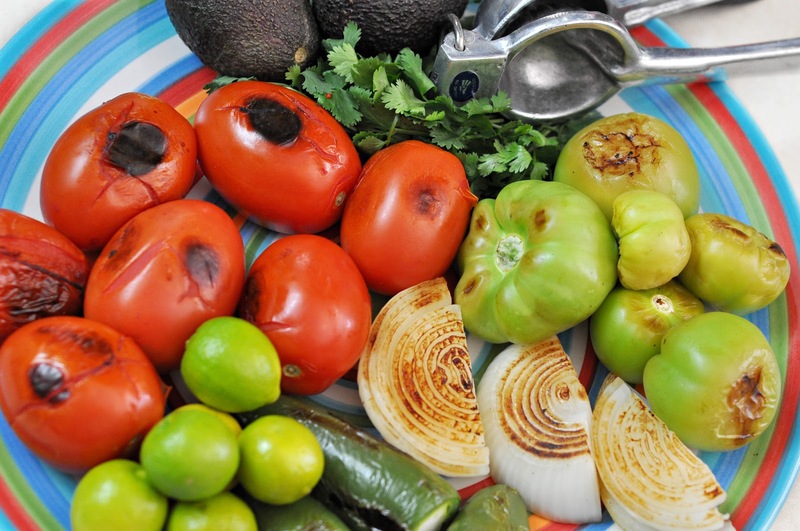 I throw my tomatoes, tomatillos (dehusked), peppers and onion (skinned and chopped in half) on my BBQ grill and roast them on low heat for about 15-20 minutes, turning occasionally. It's okay if they get some burn spots, it makes the salsa tastier. If the tomatoes are turning to complete mush, take them off earlier. You can also cook them on the stovetop in a frying pan on medium-low, it takes a bit longer though. You just want them softened up and kind of browned. My blender isn't large enough to blend everything at once so I do about half at a time but I trim the stems off the peppers first. When the salsa is blended as smoothly as you like it (I like mine fairly smooth) add the cilantro and pulse a few more times. Mix everything up in a bowl. Then when it's all blended, I juice all the limes and mash up the avocados and mix those in as well. Salt, and if you like, pepper to taste and SERVE. Yum! *The sweetness of key limes counters the heat from the peppers VERY nicely. I suppose other limes would work as well, (although you'd use far less due to their larger size) but I only use key limes. I'm seriously not a serious cook. 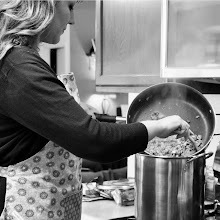 Just a real girl who loves to cook for my hubby, my kids, my siblings, my friends and anyone else I can get to sit down at my table.